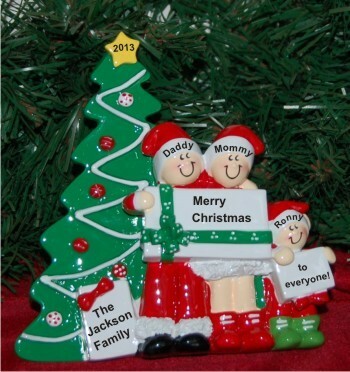 Few ornaments capture the excitement of that special moment like the Christmas morning family of 3 tabletop personalized Christmas ornament in gleaming holiday colors. These family ornaments personalized by our lettering artists are table ornaments designed for display on any flat surface. We'll hand letter your custom details onto the Christmas morning family of 3 personalized Christmas ornament that will put bright smiles on happy faces this year.